Each day brings another deluge of images and with this over-production can come a panicky sensation that the meaning of images is draining away. The urge to divert the flow and recover, or at least pause to remember, what is being lost has given rise to a new international wave of collage-making. This is the first monograph to focus exclusively on the prolific collage output of Sergei Sviatchenko, a leading figure in the contemporary collage world. 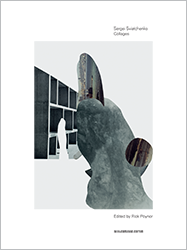 Edited by Rick Poynor, who provides a critical overview, it gathers Sviatchenko's most significant work from the past 10 years and shows little seen collages from his early years in Ukraine before he moved in 1990 to live and work in Denmark. The severe reductiveness of Sviatchenko's interventions sets them apart. Collages from his long-running Less series consist of only two or three elements floating on a jarringly bright background. The fewer fragments he allows himself to work with, the more crucial the acts of selection, excision and montage become. Depthless backdrops deny his constructions a sense of location and push them forward as graphically sculptural objects. The swift cuts that Sviatchenko makes into his source pictures give them angular new outlines that can verge on abstraction. His strangely dislocated and sometimes otherworldly inventions offer moments of unexpected balance and repose in the turbulent image-stream. Sergei Sviatchenko's work has been exhibited in Denmark, Germany, Italy, France, Canada, UK and USA. After an architectural education in Ukraine, his early output was based on collage, which remains central to his thinking and practice. Later, he turned to abstract painting. He has created large-scale paintings and collage photomurals for companies and institutions. In 2002, he founded Senko Studio, a non-profit exhibition space in Viborg, Denmark, where for seven years he curated shows by emerging artists and photographers. In 2009, he founded Close Up and Private, an Internet-based photography project dedicated to the visual language of classic style in clothing. Rick Poynor is a British writer, lecturer and curator, specialising in visual culture. His books include Obey the Giant: Life in the Image World (2001), No More Rules: Graphic Design and Postmodernism (2003), and Jan van Toorn: Critical Practice (2008). He is Visiting Professor in Critical Writing in Art & Design at the Royal College of Art, London.